WITH SILVER RECOVERED FROM GROUND ZERO! CNMI, the U.S. Commonwealth of the Northern Mariana Islands, announces a limited release with SILVER RECOVERED FROM GROUND ZERO used to create the 100 Mil .999 Pure Silver "Freedom Tower" Silver Dollar. WASHINGTON, D.C. Corp. ID Center, Thursday, 8:55 AM — Today history is being made! For the first time ever, a legally authorized government issue silver dollar has been struck to commemorate the World Trade Center and the new Freedom Tower being erected in its place. It's the U.S. territorial minting of the 2004 "Freedom Tower" Silver Dollar from CNMI. Most importantly, each coin has been created using .999 Pure Silver recovered from Ground Zero! No, this is not a misprint. The silver used in each gleaming dollar coin is from Ground Zero! You see, when the Twin Towers fell on September 11, 2001, a bank vault full of .999 Pure Silver bars was buried under hundreds of tons of debris. After months of salvage work, many of the bars were found. 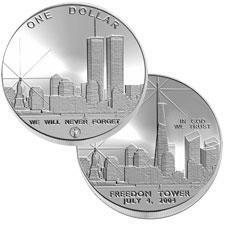 Now, the same silver that was reclaimed from the destruction has been used to create the magnificent 2004 “Freedom Tower” Silver Dollar. The stunning design of the 2004 “Freedom Tower” Silver Dollar is the work of renowned State Quarter artist and NCM Chief Engraver Daniel Carr. The obverse celebrates our recovery and renewal with a glistening vision of the new "Freedom Tower," dedicated on July 4, 2004, rising from the ashes of Ground Zero. On the reverse, the frosted New York skyline featuring the magnificent Twin Towers gleam against a mirror-like background. Beneath them is our promise: "We Will Never Forget," These silver dollars may well be among the most historically meaningful coins you will ever own. Issue price has been set at $39 per coin. However, during this limited special release, the "Freedom Tower" Silver Dollar can be yours for only $19.95, You save $20 by acting now! Includes: Each "Freedom Tower" Silver Dollar comes with a Certificate of Authenticity, and is individually numbered. In a small protest, I will not link to the site that I found that is selling it. I'm ashamed for our country. I'm thrilled to have heard that this has been pulled! There are some people paying attention -- that's encouraging.